Moraine Lake has to be one of the most iconic landscapes of the Canadian Rockies and for good reason. The glowing blue waters in the ‘Valley of the Ten Peaks’ make Moraine lake the biggest hit on my Banff Photography Workshops in September. This image was taken in mid August at the height of wildfire season. I’d been itching to get out to the mountains in Banff National Park for days but the wildfire smoke had been a major problem all summer long. When I saw that the forecast was calling for rain in the Lake Louise area I knew I had a chance to witness conditions like this so I headed out with high hopes. I arrived at blue hour and the low lying clouds looked very promising, but within 25 minutes the peaks were entirely obscured by cloud and my hopes sank. I spent some time finding this composition and settled in for a one hour wait to see if the peaks would pop through the clouds and catch some light. Sure enough, the clouds gradually thinned to reveal the spectacular mountain tops and I was jumping for joy and punching the air like a total moron. I may have even let go a few involuntary ‘Whoops!’. It’s moments like this that make all of the planning, driving and waiting in the cold totally worth it. After all of the wildfire smoke I really needed the satisfaction of seeing these conditions and being able to capture the moment on my camera was the icing on the cake. 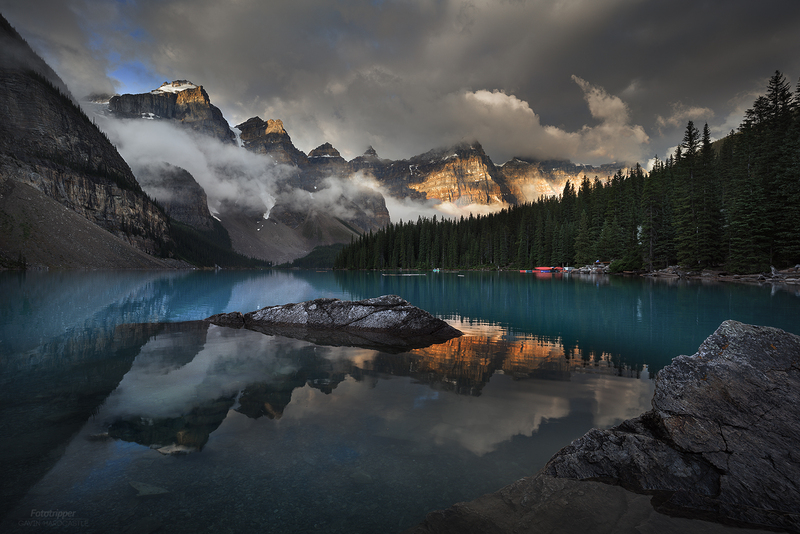 If you’d like to order a high resolution print of ‘Moraine Lake Redemption’, please get in touch via my contact form and let me know your preferred size. Prints can be provided under acrylic, on metal, paper or even mounted and framed depending on your taste. Never miss an update. Get news on my latest tutorials, reviews and image releases. Fototripper will use the information you provide on this form to be in touch with you and to provide updates and marketing.